To help your audience to understand your points. Helping your audience to learn something. Enabling you to get your message across. But have you ever thought about what happens when you build too much information into your slides? Research (Richard E Mayer, The Cambridge Handbook of Multimedia Learning-Cambridge Handbooks in Psychology) shows that your audience has a problem when it tries to assimilate the same information from two different sources…at the same time. What happens when you build too much information into your slides? The problem occurs when you fill your PowerPoint slides with bullet point lists or paragraphs of text and then start to read out the projected text. So what happens is that your audience tries to read the text on the screen. That’s at one speed. And, at a different speed, they try to listen to you reading the same text. The result? Confusion. There’a good example of PowerPoint overload with this conference presentation in New York. And this death by PowerPoint shareholders presentation was equally hard going. When members of your audience become confused they switch off. That’s because their working memories have become overloaded and they have become frustrated. However, as a presenter, it’s not the reaction you want. 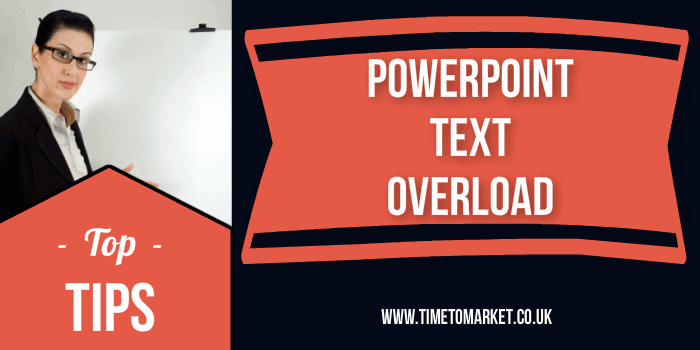 Here are two very simple ways for a presenter to avoid PowerPoint text overload when you give a presentation. Cut The Text From Your Slides. Stop Reading The Text On Your Slides As You Present. That’s it. Less text, more visuals and more focus on you, the presenter. For more tips on how to avoid PowerPoint text overload you can always join us for a presentation skills course or organise a corporate training day.